Difficulty: moderately difficult. Elevation gain again depends on the route you choose, we climbed 2000′ elevation. We were down to the last couple days of our Oregon spring vacation. 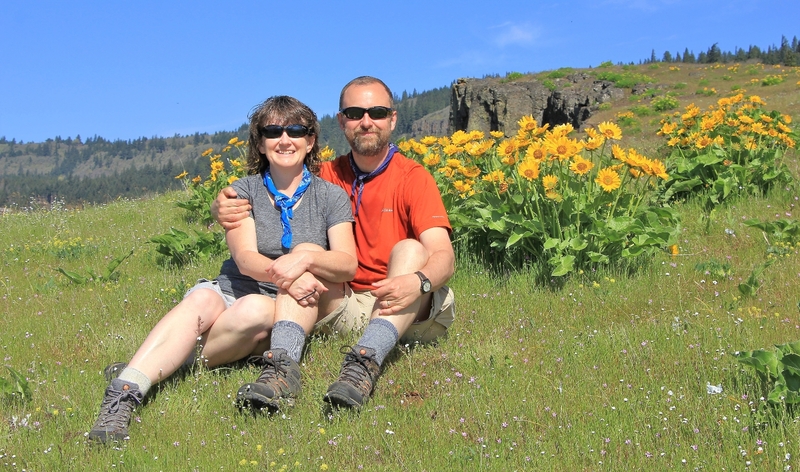 After a beautiful hike at Silver Falls State Park, we made our way to The Dalles, Oregon where we checked into Cousin’s Country Inn for two nights. 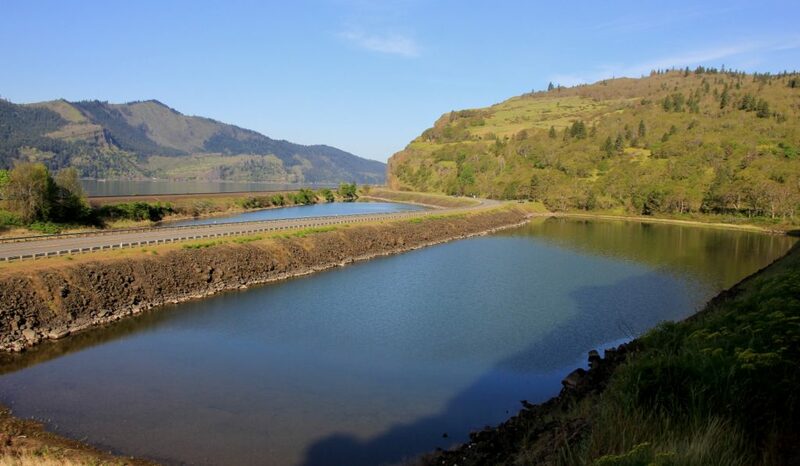 The Dalles lies 73 miles from the eastern edge of Portland and is roughly the starting point for the arid side of the Columbia River Gorge. We’ve hiked many of the lush waterfall trails closer to Portland, but this year was the first time we’d hiked the arid portion. 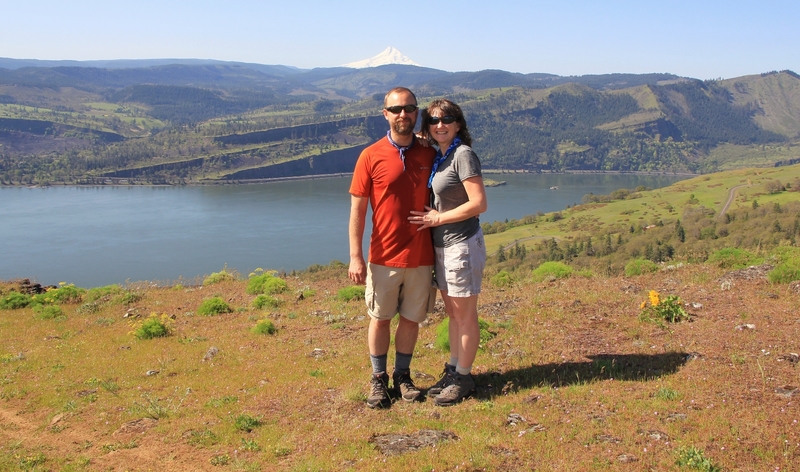 Earlier in the month, we hiked The Labyrinth on the Washington side of the gorge. 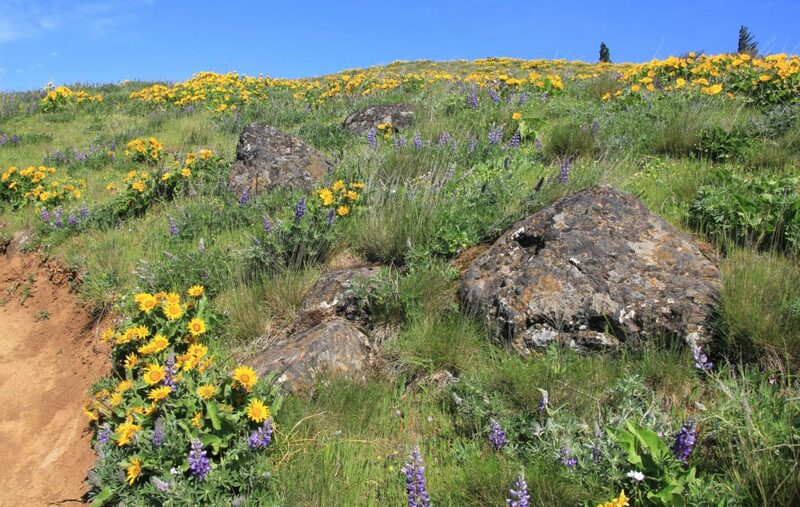 We enjoyed the hike and I’d heard the area has spectacular wildflowers a little later in the season. 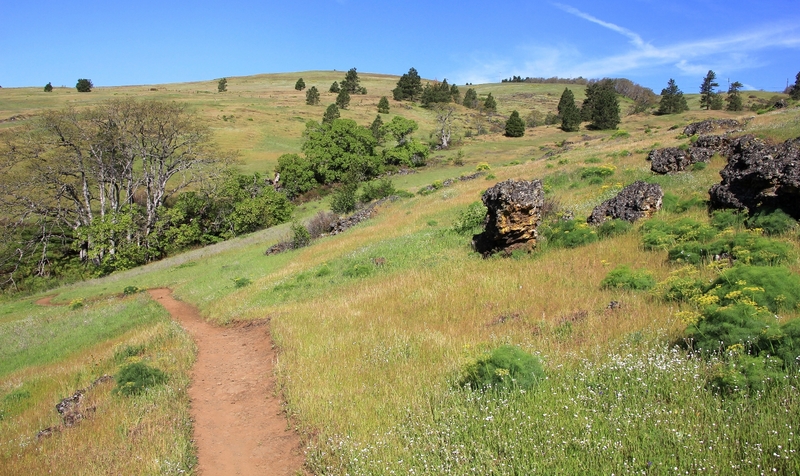 The nearby Coyote Wall Trail had great reviews and seemed like a good destination for a sunny and warm late April day. 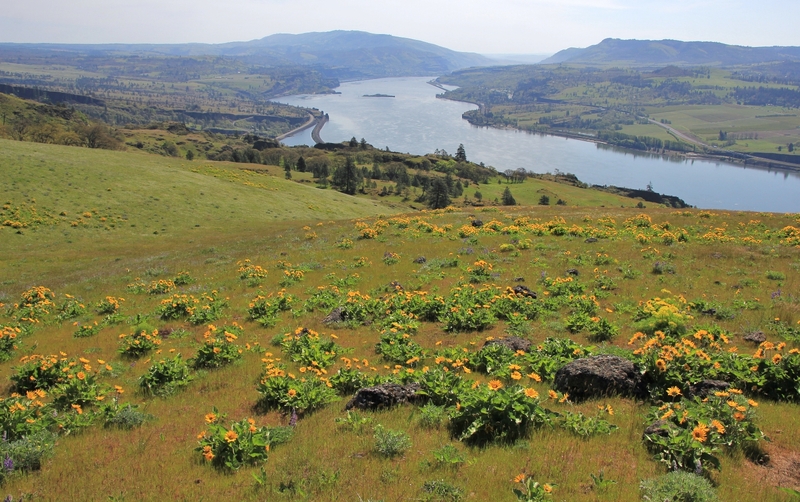 We made the short drive from The Dalles, across the river into Washington and to the Coyote Wall Trailhead (elevation 162’). We began our hike at 9:00 and headed east along a paved stretch of the old highway which is now closed to traffic. 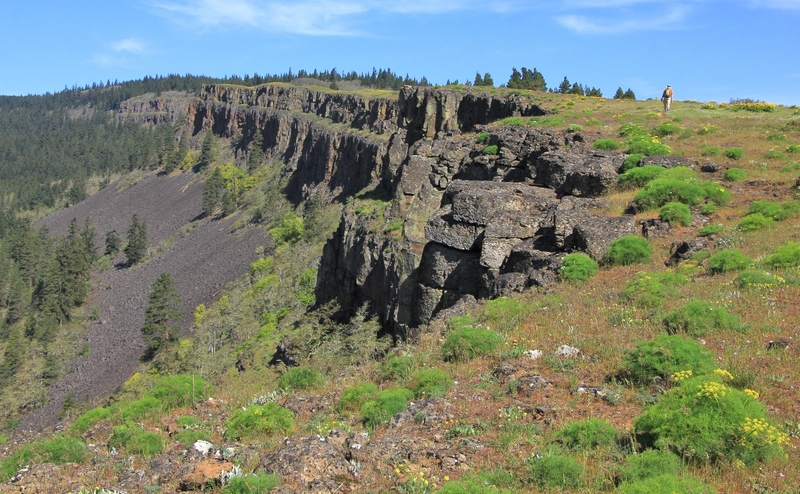 We rounded Locke Lake passing under the end of the massive basalt cliffs known as Coyote Wall. We continued about half a mile along the old highway before turning left up an old jeep track signed #4426 Old Ranch Road. The road quickly turned to mostly single track trail as we began our climb up the open hillside. Wildflowers were blooming and the grass was that brilliant green you only see in spring as everything is coming back to life. 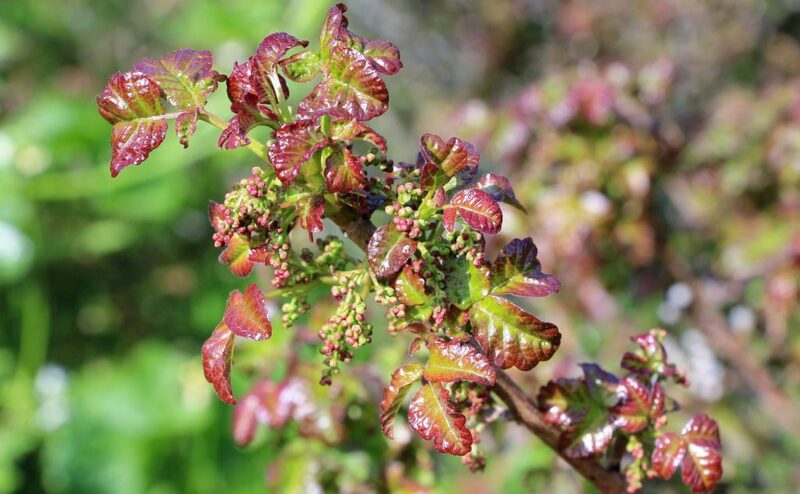 We also began seeing poison oak…everywhere! Watch your step! If you stay on trail, you will be fine. As we climbed, we began to get some nice views of the tip of Mt. Hood to the southwest. Soon we came to another split where we turned right on #4425 Little Maui. 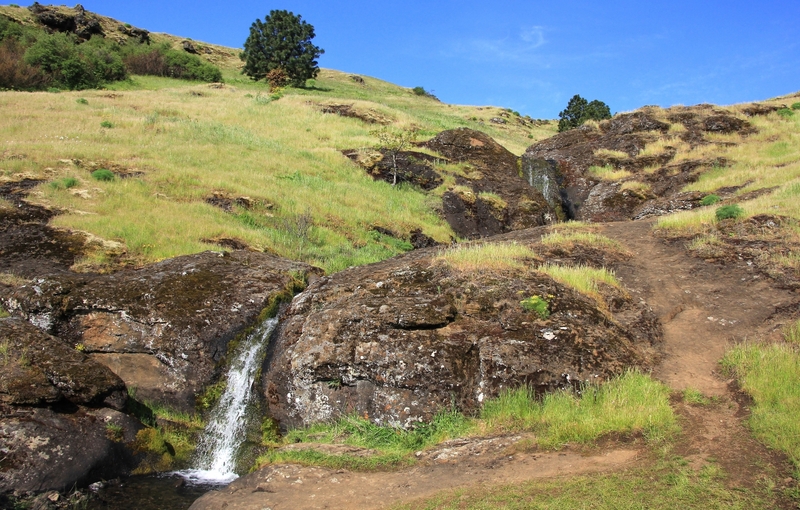 We were now overlapping with some of the trail we had hiked on April Fool’s Day including a cute little waterfall. As we continued climbing, we reached another intersection with Old Ranch Road. We turned right onto it and followed it a short distance before turning off on the Coyote Wall Trail #4428. Now we were really climbing. 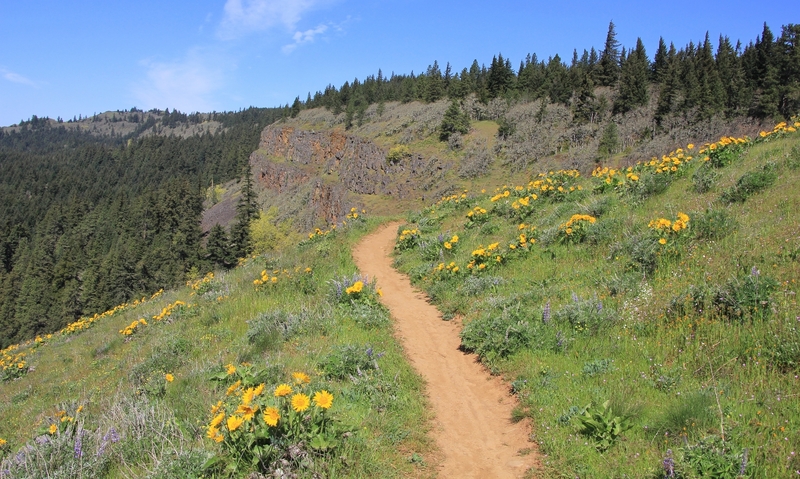 It was quite the grind up some steep sections, but the views and wildflowers got better with every step. 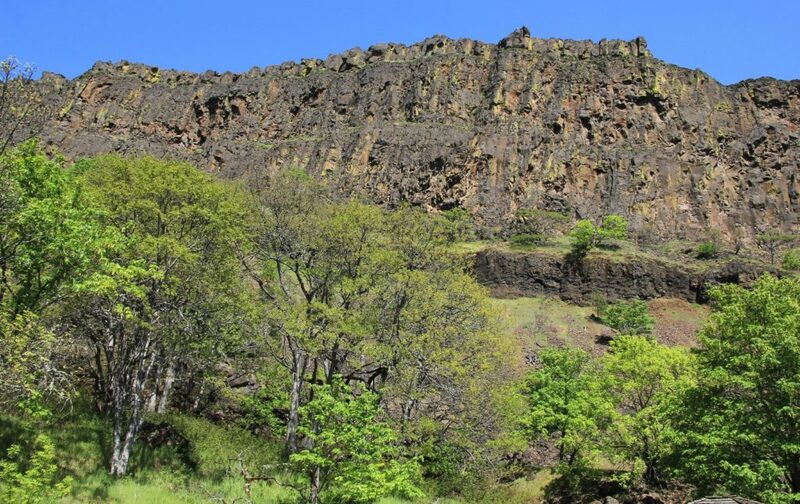 Still climbing, we were treated to some impressive views of the massive Coyote Wall basalt cliffs. 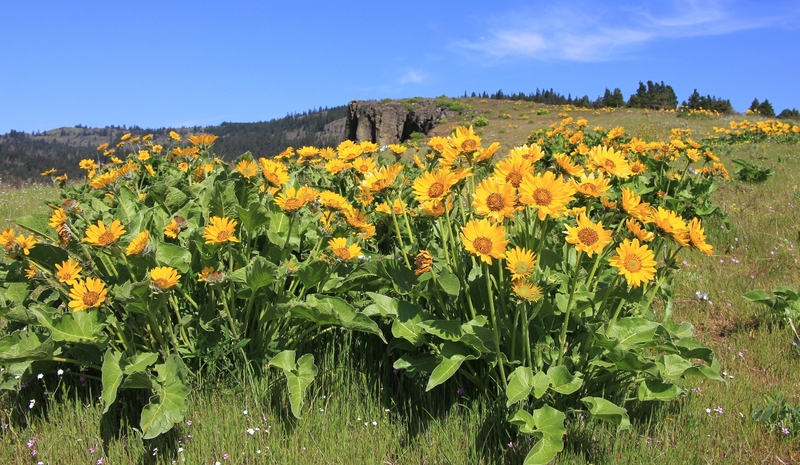 Then we entered a stretch where the balsamroot splashed the hillside in brilliant yellow. 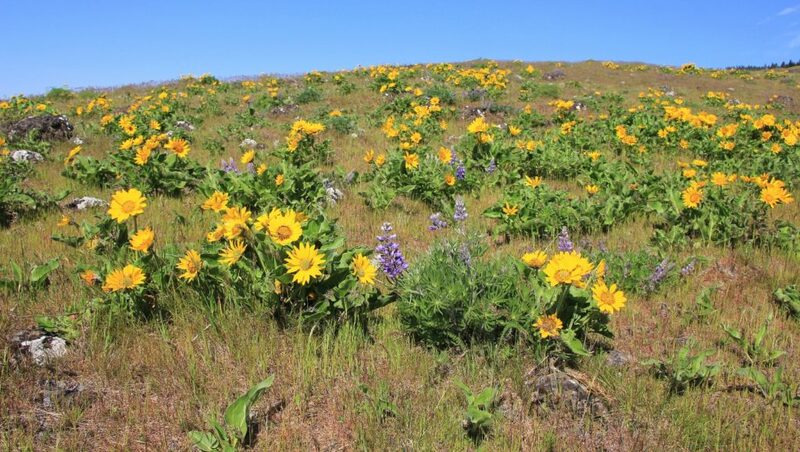 And then the lupine began in abundance. The colorful explosion contrast against the blue sky was a feast for the eyes. 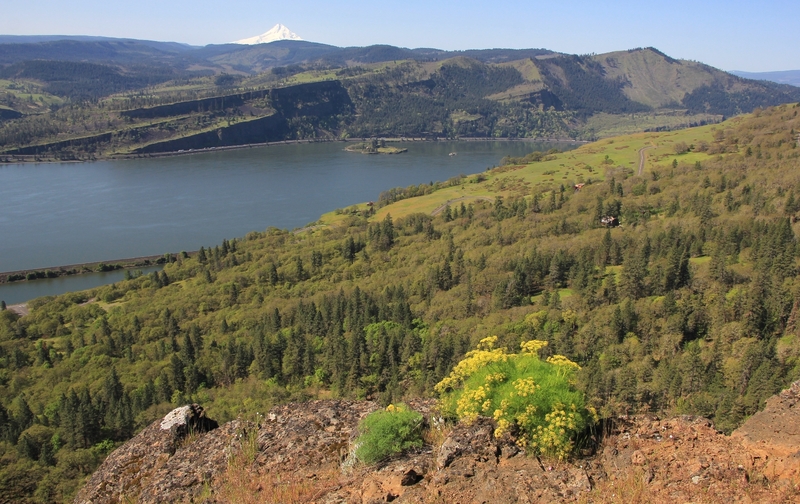 And, of course, don’t forget those fantastic views of the Columbia River Gorge and Mt. Hood behind us! We took a snack break at an old massive down tree and enjoyed the views. We then continued up the hill through oak trees and soon intersected with the Atwood Road (which is now a nice trail) at roughly 3.0 miles from the TH. 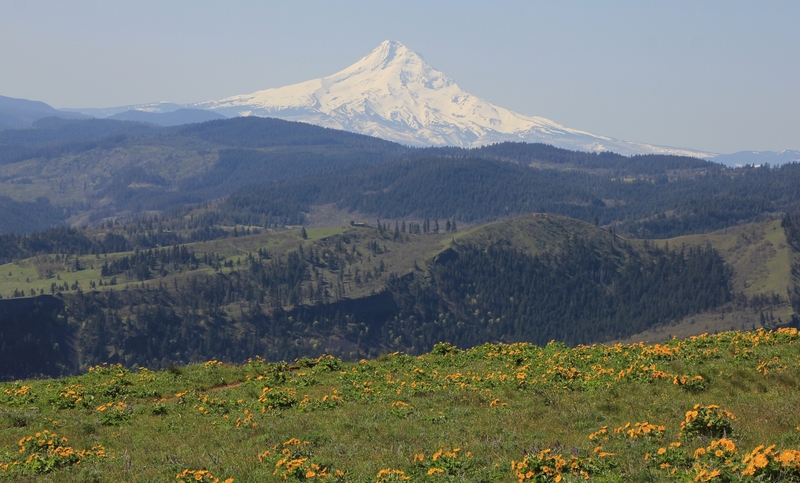 Once on the Atwood Road, we enjoyed easy hiking through the forest with occasional views of Mount Hood. 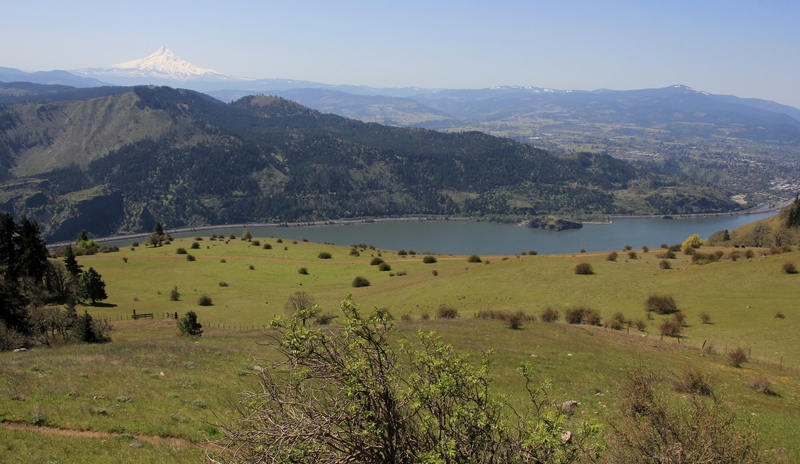 At 4.4 miles from the TH (elevation 2,128′) we came to a house, wide open views of the Gorge, and we hit paved Courtney Road. At this point, navigating became a bit of a crap shoot. One trail guide showed that we would intersect with a trail directly beneath Coyote Wall if we continued down the road a bit; however, it also mentioned that this trail may eventually be closed to protect private property. If we could make it through on that questionable trail, we’d have some impressive views up at Coyote, so we took our chances. Another guide talked about a new trail that is planned on public land further to the west, so it was possible we might also find that. 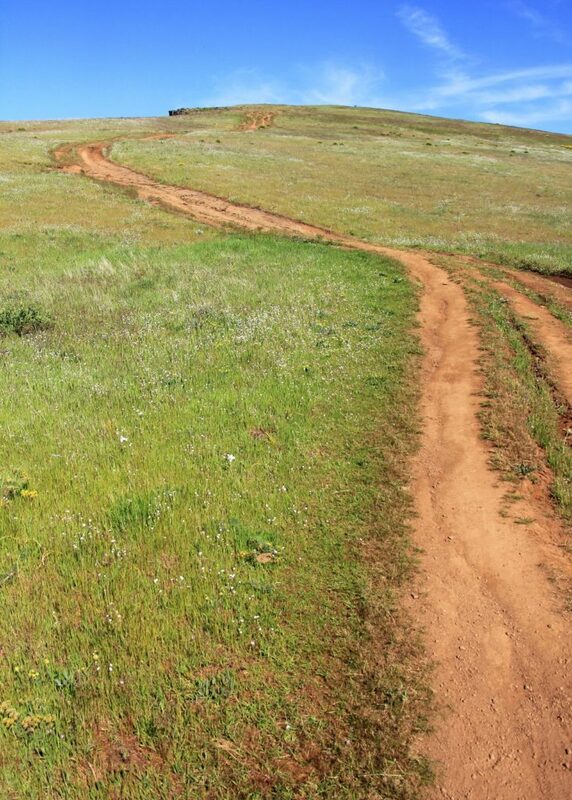 Worst case scenario, the road would eventually bottom out at the trailhead. I knew we wouldn’t get lost. We began dropping down paved Courtney Road. 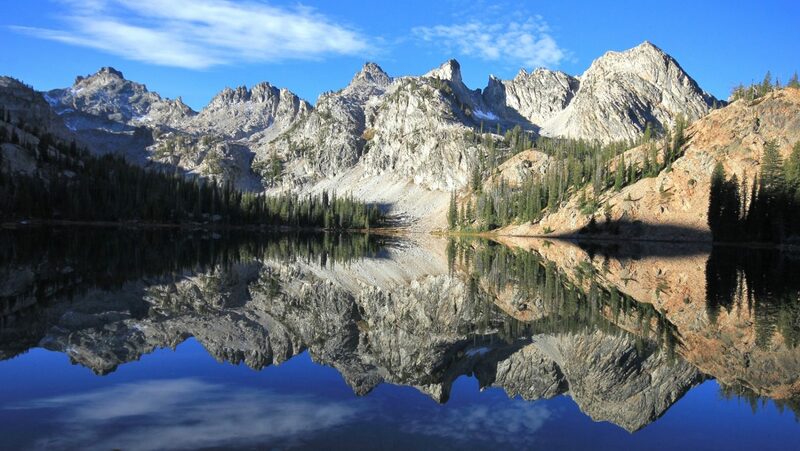 While hiking on pavement isn’t enjoyable, the outstanding views provided a nice distraction. We found a gated side road signed 230. From the trail guide, this appeared right. An older gentleman on a mountain bike passed by and confirmed that the old road would turn to trail and drop us down to the TH. 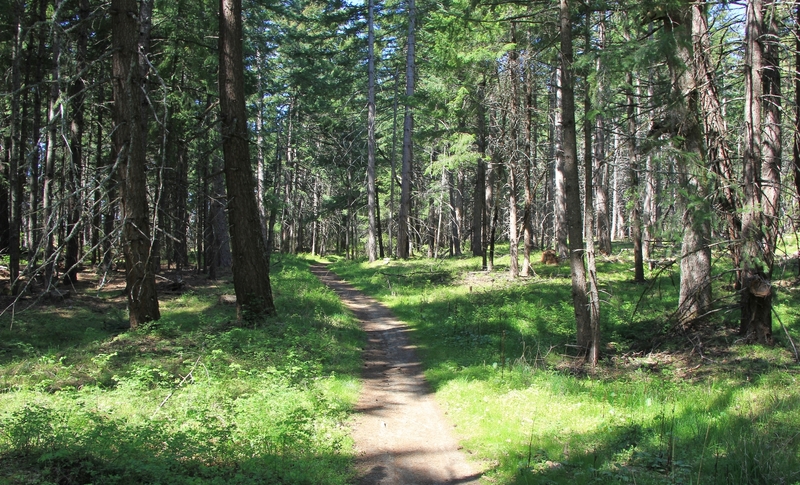 We descended through shaded forest on faint, but distinct trail and I “think” we made the correct turn at a couple junctions. I’m pretty sure we were on the right path, but soon we came to an area that was being logged. All of the downed trees and debris caused the trail to be completely obscured. 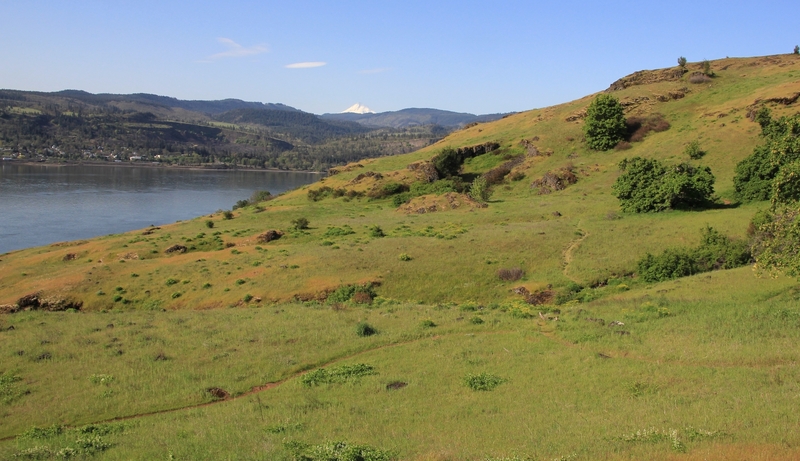 Looking at this map that I found on the Oregon Hikers website, I think we were on trail that is now officially closed. With the help of our GPS, we could have bushwhacked our way back to the car no problem. 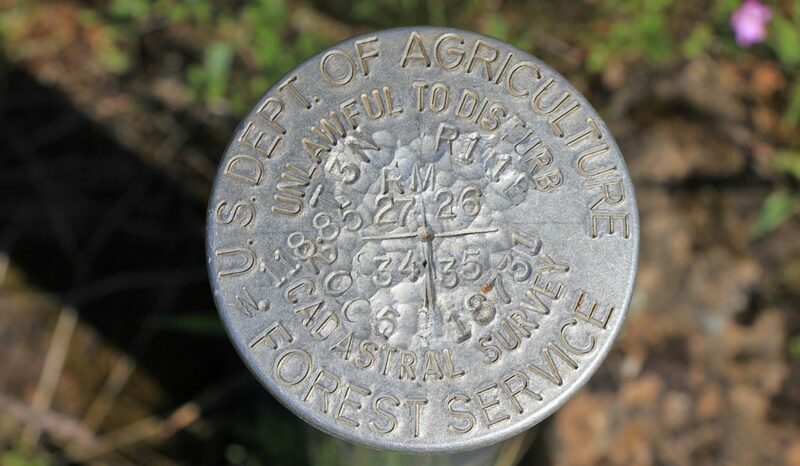 But we always treat private property with the utmost respect and this area clearly was no longer meant for hikers. We made our way back to the road and began the descent on hard pavement with a toasty temperature of 85 degrees. I estimated we had 2-3 miles of pavement pounding to get to the trailhead. Slowly we descended, the river coming into closer and closer view. Jason asked, “if someone stopped, would you accept a ride?” I replied yes and he told me to smile at everyone who passed. I didn’t, but I guess we looking friendly enough because a couple minutes later a BMW sedan passed, stopped, and backed up. “Did you make a wrong turn” asked a clean cut looking man. I think I replied something like, “sort of, not really.” He offered us a ride and we gratefully accepted. Fortunately, our angel was a hiker from Portland out enjoying the nice weather. He had hiked The Labyrinth earlier in the day and then had then went for a drive— which was fortunate for us! It was a nice ride the rest of the way in his luxury car with open sunroof. I’d estimate it was about a mile before we reached the trailhead. We expressed our gratitude and then he was off and our adventure was over. We had hiked approximately 9 miles with 2,000’ elevation gain. 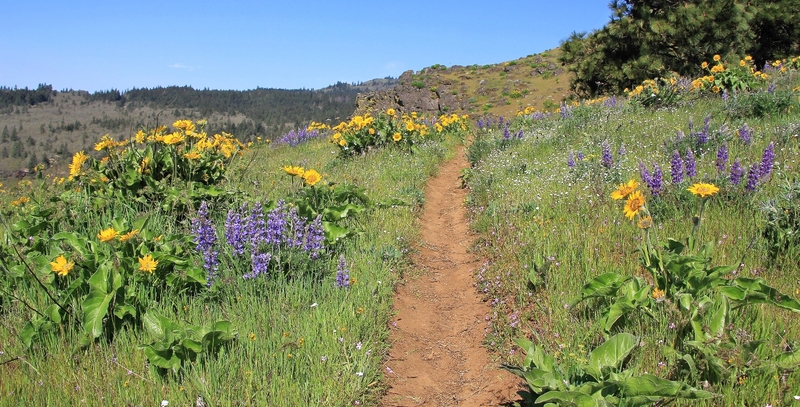 I highly recommend this hike if you are near Portland in late April through roughly mid-May. The wildflowers and views really were amazing. We’ll do this hike again, but we’ll do it smarter now that we know the area better. 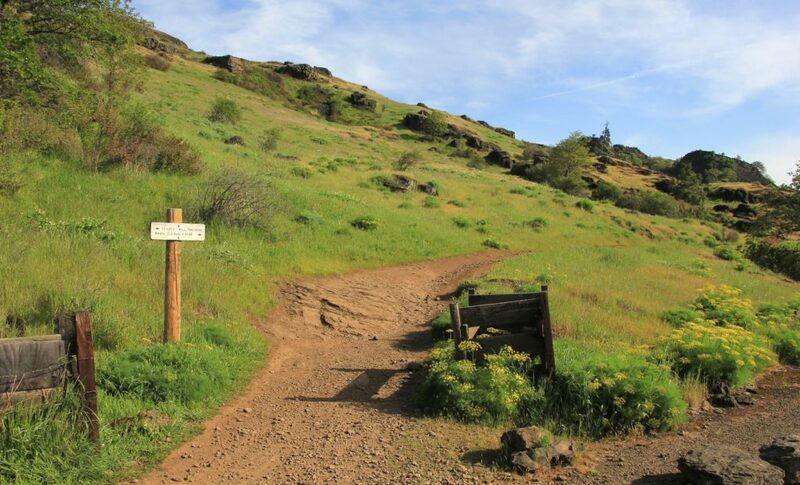 I’d go up the Labyrinth Trail to Atwood Road, turn west, then down Coyote Wall to Little Maui and back to the trailhead. 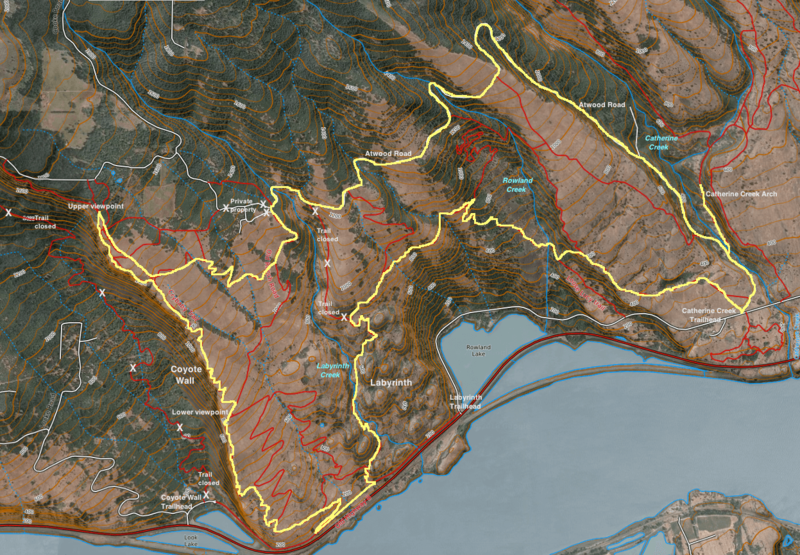 Or if we were in the mood for an even longer hike, I’d do the route in yellow shown here. 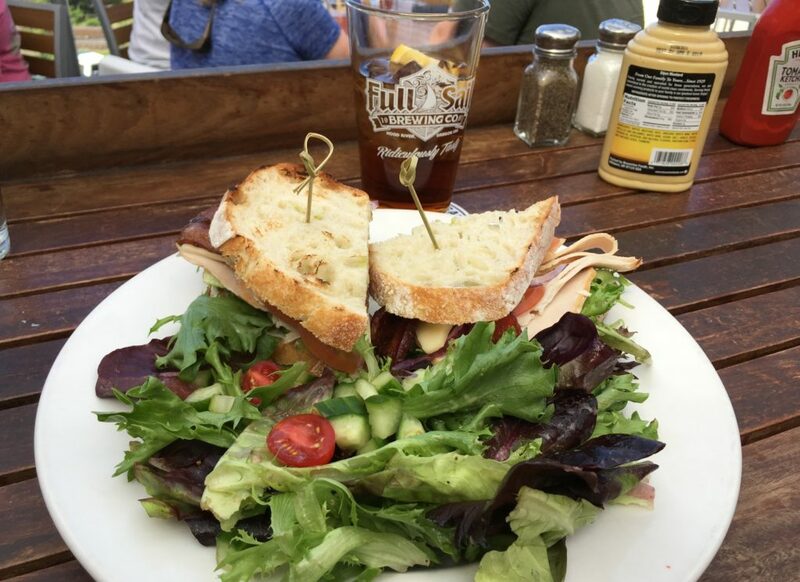 Our reward for our long hike was a burger for Jason and a turkey sandwich for me at Full Sail Brewing Company in Hood River, Oregon. Yum! 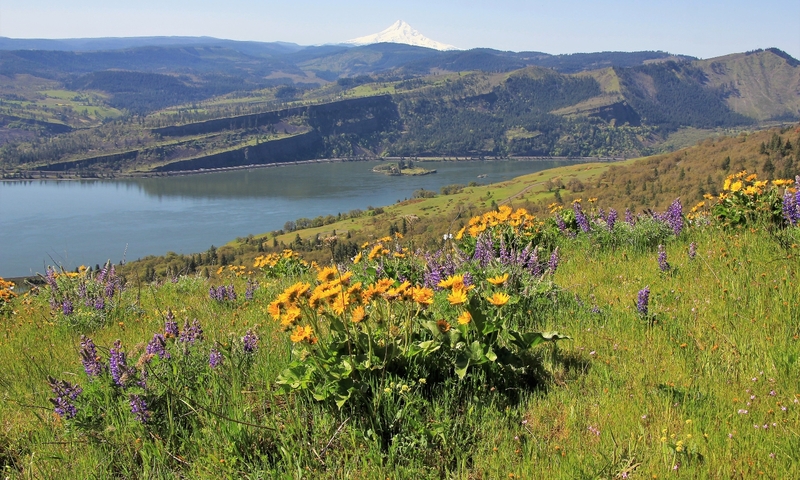 Directions to the trailhead: if coming from Portland, travel east on I-84 and cross the Columbia River on the toll bridge at Hood River. After crossing the river, turn right on Highway 14 and drive to the small town of Bingen. From Bingen continue 3.5 miles to Courtney Road which is between mileposts 69 and 70 on Highway 14. There is a nice, new paved parking lot to the right. Pit toilet available.